Home / Glass Fusing / Instruction Sheets / I called it a Fertility Bowl! It actually started with me staring at a piece of plain black Bullseye Opal glass. That was fairly uninspiring so I swapped that for a piece of gold iridised black. Better, but still no light bulb going on. But I did have a sense of wanting to do something a bit exotic. Images of golden bowls sort of floated around and so I played a bit and the final concept eventually forced its way out. By the way, all glass is Bullseye COE 90. So I selected what I considered to be an exotic shaped mold and let that dictate the rest, as you will see. 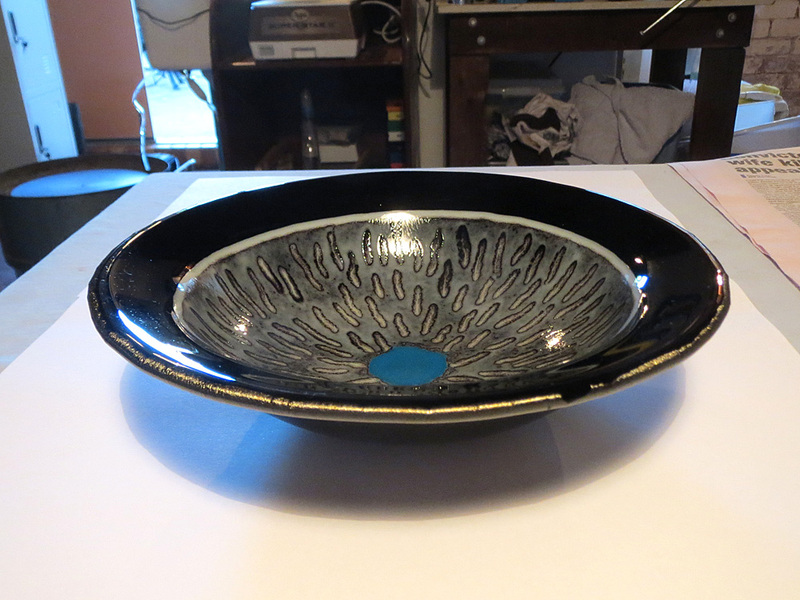 The first step was to cut the 3 mm Bullseye Gold Iridised Black (0100-38) glass into a 230 mm diameter circle to fit the bowl. This would be fired with the iridised surface down. Because I wanted the edge to turn up to reveal the iridised surface, the top layer would be smaller to allow the 3 mm edge to pull in. The top layer was to be 3 mm Opal White because I then intended to decorate it with frit and manipulate the frit so the white would show through, as you will see. The top layer was cut at 170 mm diameter. The size dictated again by the bowl. All will reveal itself. The white top circle was then centered and glue to the black base. Of course, make sure you clean your glass before doing this. The assembly was then set on a couple of pieces of scrap glass on newspaper ready for applying the frit. Sitting it on some scrap simply raises it off the paper and makes lifting it later much easier. The newspaper makes recovering any spilled frit mush easier. So I first sprinkled a good layer of black frit on to the central white top layer. I didn’t worry about any that spilled over onto the black as that would be cleaned off later. On top of the black I then sprinkled a layer of Deco Grey (0136). Again, I gave it a good covering. In the center I then added a small circle of Egyptian Blue (0164). Guess what this represents! Taking a toothpick, sharp end, I made small slashes, in the frit layers, radiating out from the center of the circles. You know what these are going to be. Don’t you? All frit that spilled over onto the black base was then carefully brushed off onto the paper. Yes, this is a mix of white and grey, but I tend to keep everything. You never know when it will come in handy. This was then full fused. The firing schedule is below. By the way, I fuse on Bullseye Thinfire shelf paper. it’s just easier and quicker. The fuse went well and I was more than happy with the result of the frit design. The Egyptian Blue really stands out nicely, as intended. You can see just how the iridised edge pulled in and turned over slightly. Satisfied with the end result, this went back into the kiln for the slump. I use boron nitride MR-97 in all my molds now. Just so much easier. You can find the slumping schedule below, as usual. I am more than satisfied with the end result. The estimate for the size of the center feature worked our well and the frit work really did what I hoped. The gold iridised black base has also given it that exotic feel. It really looks like it could have came out of some lost temple somewhere. At least, that’s how I feel, and that is the most important thing. I would love to have it displayed sitting on a cool golden stand, but that will just have to wait. Anyway, I hope you enjoyed this and it gives you some inspiration. Beautiful! Thanks for sharing the process. Hi Jeff, nice work. You mentioned using MR97. Would you mind sharing where do you buy this in Australia? I haven’t found any sources. When trying to purchase overseas it falls into the “dangerous goods” category. From memory that added considerable cost to the postage. Going from memory, it is quite a while since I looked at it. I had to import it. Wasn’t cheap and each can cost something like $70 but it lasts for ages. It is dearer than Thinfire but so much easier, and of course a lot dearer than kiln wash.